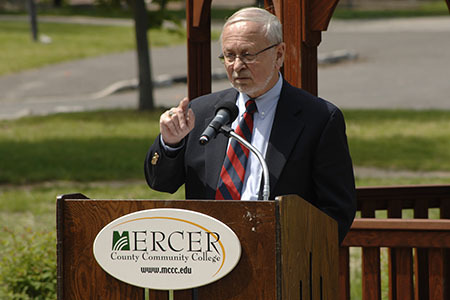 West Windsor, N.J. -- “There are teachers who go the extra mile and Mary Hayes was one of them,” said Mercer County Community College alumna Helen Vizaniaris (’92), who attended a memorial tribute to her beloved late professor on May 10. All these years later, Vizaniaris still recalls the nurturing and support she received from Hayes, from whom she took numerous computer classes on her way to her associate degree in Information Systems and a job with Hamilton Township. 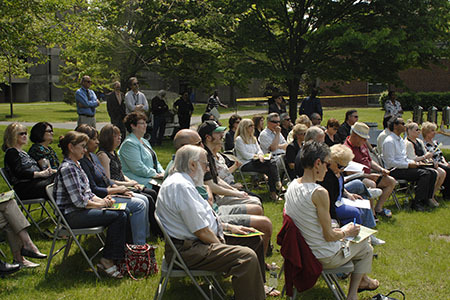 Vizaniaris was among more than 50 staff and faculty members, family members, former students and friends who gathered for the official dedication of the Mary Hayes Tribute Garden on the college’s West Windsor campus. The garden includes a gazebo, walkway, paving and numerous plantings, and was planned and installed by students in the MCCC Horticulture program over the past 18 months. It was made possible through a $35,000 multi-year donation by Hayes’ sister, Joan Silver. 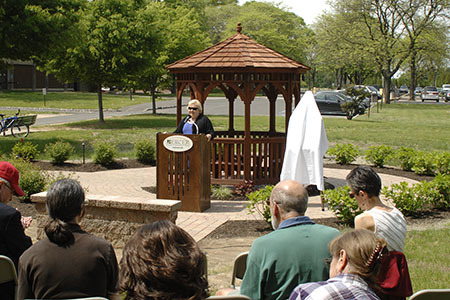 Opening the ceremony was MCCC President Patricia C. Donohue, who noted that the garden is a place of peace that is already being used regularly by staff and students. “Professor Hayes was an inspiring and encouraging instructor. She was well known as helpful and patient with her students and her colleagues. 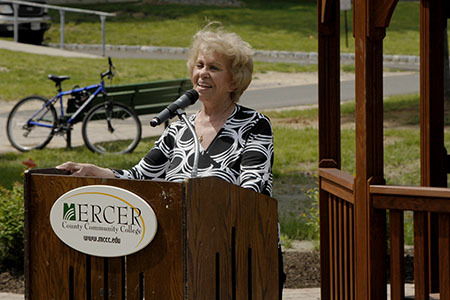 She remains an important member of the Mercer family,” Dr. Donohue said. Hayes taught Mathematics and Computer Science at Mercer from 1980 until her retirement as a Professor Emerita in 2006. Ornamental Horticulture Program Coordinator Amy Ricco described the back story of the garden project and the valuable learning opportunity and team work it afforded her students. She explained that students in Basic Landscaping and Planning II, under instructor Carrie Stanker, submitted the initial designs and Ms. Silver chose among the top three, pulling elements from two different designs for the final plan. Students studying Landscape Construction, taught by Kevin Minton, took over from there in the fall. She noted that their commitment to the project extended even beyond the end of the semester. “They were finishing up the gazebo and paving in December – in the snow – the day after grades were due,” Ricco said. Then they returned in April to do the planting. According to Ricco, the final touches are still to come. Her students will add plantings to screen the utilities and parking lot, and plant seeds to re-establish the lawn around the gazebo. Ricco thanked alumnus Timothy Serinese ’99 (A.S., Plant Science), of Timothy’s Center for Gardening in Robbinsville, NJ, for welcoming students to the nursery, where he provided advice on paving materials and pricing, and furnished the materials at a discount. Chris Avani and student Colin Pritchard from Shemin Nursery, located in Lawrenceville, helped with the selections of shrubs and flowering plants. Avani also taught the students how to install lighting in the garden, returning to campus at least three times. Schwartz recalled her generous, loving spirit by noting her practice of bringing in birthday cakes for her colleagues. “We would measure our worth by the size of the cake Mary brought in,” he said with a fond smile. Mary Hayes' family received a framed remembrance of the event. 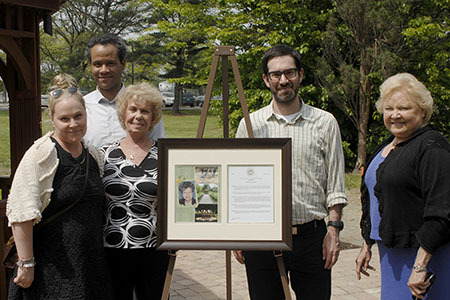 Pictured are, from left, daughter Sharon, son-in-law Justin, sister Joan Silver, son David, and MCCC President Patricia C. Donohue. 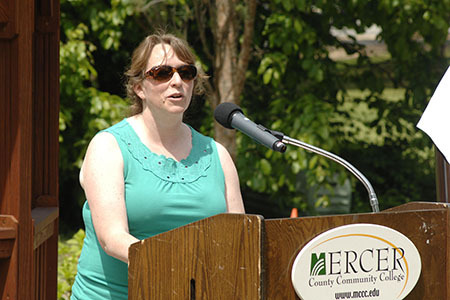 MCCC President Patricia C. Donohue addresses the audience from the garden, which features a gazebo, paving and planted circular borders. Horticulture Program Coordinator Amy Ricco explains that her students became immersed in the project. Long-time colleague Art Schwartz recalls Professor Hayes' compassion and versatility. Joan Silver thanks students and staff who helped make the garden possible. 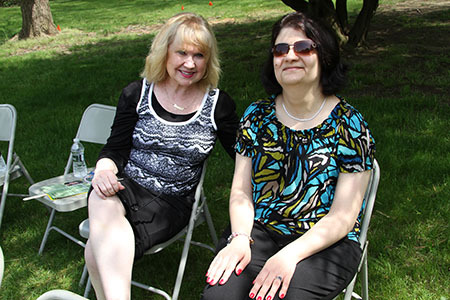 Advisor Susanne Kotch attended the event with MCCC alumna Helen Vizaniaris, one of Hayes' students in the early 1990s. Audience members listen to the moving ceremony.